Experience the perfect blend of casual relaxation and business convenience with the most unique hotel location in downtown Corpus Christi. Just minutes from downtown businesses you can enjoy fresh sea air and sand between your toes as you walk the beach behind our hotel. Our spacious bayfront rooms with fantastic views of the bay and marina featuring free high speed internet connection will allow you to relax and conduct business. Enjoy a hearty breakfast in our Sandpiper Restaurant or maybe a cocktail at our beach side bar. Just a ten minute drive gets you to area attractions such as the Texas State Aquarium or the USS Lexington Museum. After work we will provide transportation to downtown restaurants and entertainment based upon availability. When its time to leave we will take you to the airport as well. Dont forget we have over 10000 square feet of meeting and banquet facilities available for any of your business or entertainment needs. Our Sales and Catering Staff is available to help you plan anything from an intimate destination beach wedding to a corporate meeting. 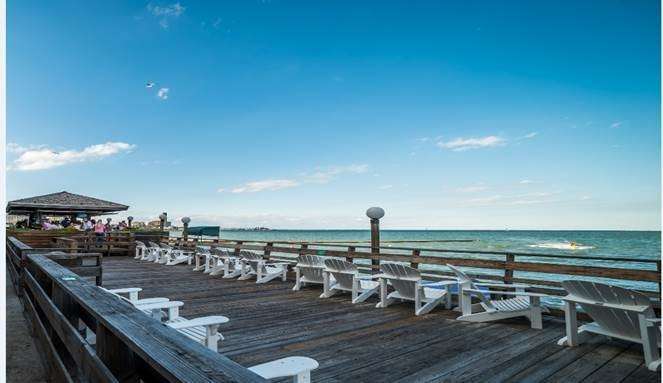 Try the Emerald Beach Hotel once and we are sure you will return every time you visit Corpus Christi. Sandpiper Restaurant: Sandpiper restaurant breakfast only. Bar bites available at bar outlets until 9pm daily. Located in downtown Corpus Christi directly overlooking the bay. Just minutes from downtown businesses and many of the local attractions including the Texas State Aquarium and USS Lexington Museum. Also a short 15 minute ride to Corpus Christi International Airport. Art Center of Corpus ChristiHead North on S. Shoreline Blvd toward Buford Street- take right on S. Shoreline Blvd- Destination will be on left. Del Mar CollegeTurn Left on S. Shoreline Blvd- Continue on Ocean Drive 0.3 Miles- Turn right onto Ayers St. 1.1 Miles- Turn Left onto Baldwin Blvd- 65 ft. Your destination will be on the right. Hurricane Alley WaterparkHead north on S. Shoreline Blvd toward Buford St 1.5 mi- Slight left toward N. Chaparral St. 0.2 mi- Turn right onto N. Chaparral St. 0.5 mi- Turn left onto Hirsch St. 262 ft- Continue onto E. Port Ave 384 ft- Destination will be on the right. American Bank Center/Selena AuditoriumTurn Left onto S. Shoreline Blvd- destination will be on N. North Shoreline Blvd. on the left. Texas A and M University - Corpus ChristiHead North on S. Shoreline Blvd.- Continue onto Ocean Drive- Slight left to Stay on Ocean Drive- Turn right onto Island Blvd.